FreeSnell is a program to compute optical properties of multilayer thin-film coatings. Spectral data may be given in terms of wavelength, photon energy, frequency, or wavenumber. 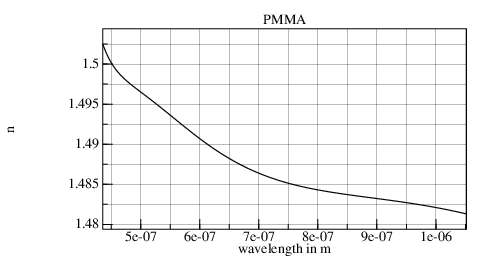 The real part of each spectral refractive-index value is n; the imaginary part (extinction coefficient) is k.
The bottom half of this program graphs PMMA's index-of-refraction, which agrees with the plot from the Refractive index database. FreeSnell is distributed with a relational-ISAM database, "nk.rwb", containing refractive-index spectra for several hundred materials. These spectra come from a variety of sources described below. For some materials (particularly metals), spectra from two sources are combined to yield a wide range spectrum. This is not done in cases were the two sources disagree over n and k values at interleaved wavelengths. contains "README.TXT" identifying the Sopra files. This file is used to supply annotations for Sopra spectra. It is renamed to "sopra.txt" in the FreeSnell directory, but not distributed. void and test are removed from "nk.rwb". "sicrir.nk" and "sio2ir.nk" are incorporated into the si and sio2 spectra, respectively. Sopra's convention of using -a as a suffix for extraordinary-ray (birefringence) is automatically converted to a suffix of -e, the convention used by luxpop.com (below). Ordinary-ray -b is removed from the material name. Some idiosyncratic names have been regularized. As of 2010-06-10, many of the files are duplicates (eg. Ni.93V.07_llnl_cxro.nk and Ni.93V.07.nk). 28 of the files are concatenations of 56 smaller files. But some of these concatenations have large gaps where the n and k values differ significantly across the gap. In these cases, concatenated data-sets obscure the fact that grossly inaccurate data may be interpolated in the gap. To use FreeSnell for X-ray calculations, it would be better to create another database containing just X-ray spectra. FreeSnell avoids the aggregated gap problem by eschewing the X-ray and combination files, which leaves the 43 files whose names end with "_palik.nk". Three spectra, "Cr_palik.nk", "SiO_palik.nk", and "W_palik.nk" are missing but can be extracted from the combination files. But "Cr_palik.nk" is not compatible with the chromium spectra from the other sources. There are many duplicated wavelength entries reported in luxpop-log.txt. The nk script accepts the first entry for a wavelength and ignores the others. If the ratio between successive wavelengths is more than 3, then nk reports warning: abscissa-gap (but continues processing). If the ratio is larger than 9, then nk reports error: abscissa-gap-too-large, and discards the rest of that file's data. That is the correct treatment for "TiO2_palik.nk" and "TiO2-e_palik.nk", where the gap is at the last line of the file; but the wrong treatment of "AlSb_palik.nk" and "AlAs_palik.nk", where the gaps come in the middle of the files. I remove the short-wavelength sections of "AlSb_palik.nk" and "AlAs_palik.nk" for the purposes of building "nk.rwb". These 46 "_palik.nk" files describe 43 materials. The files "Se-e_palik.nk", "Te-e_palik.nk", and "TiO2-e_palik.nk" have extraordinary-ray spectra while "Se_palik.nk", "Te_palik.nk", and "TiO2_palik.nk" have ordinary-ray data, those crystals being birefringent. The files "ir-ZnSe_palik.nk" and "ir-ZnS_palik.nk" have data only in the infrared, which dovetail with the Sopra data "znse.nk" and "znscub.nk", respectively. "a-C_palik.nk", arc-evaporated carbon, does not agree with Sopra's carbam, (a-C Amorphous Carbon). Many of these materials are included in the Sopra bundle; but the CRC data covers a wider wavelength span than the Sopra spectra. Doing "nk --add" of both the CRC and Sopra files produces wide bandwidth spectra with finer resolution in the visible and near-infrared bands. S. G. Warren, "Optical constants of ice from the ultraviolet to the microwave,"
Appl. Opt., Vol. 23, No. 8, 15 April, 1984, pp. 1206-1225. I developed hdpe.nk from published graphs of infrared transmission through polyethylene films. pe.nk is shorter waves in polyethylene. 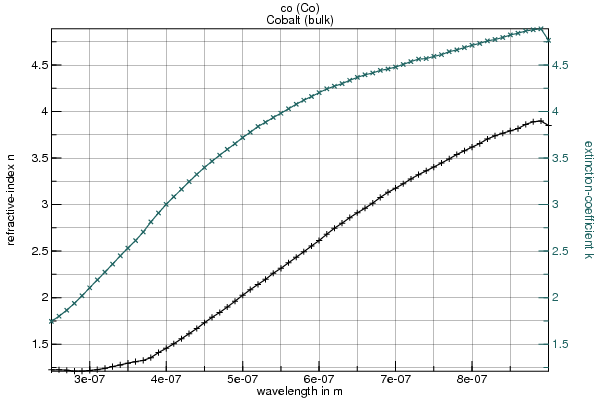 Another potential source of refractive-index spectra is http://www.rpi.edu/~schubert/Educational resources/Materials - refractive index and extinction coefficient.pdf, although the PDF does not facilitate easy extraction of the data. The nk program is used to create, manage, and query a refractive-index spectra database. The nk program reads all the various formats, figuring out which one from the file header. So far, files in all the formats have a ".nk" suffix. Note: With recent releases of FreeSnell (version 1b4 or later), the relational database containing the Sopra and metal spectra is included in the distribution. So installing the nk script is optional. The "nk.scm" file in the distribution functions as a shell script named nk on Unix systems; under MS-Windows, the nk icon invokes "nk.scm" as an interactive command-line shell with the prompt "nk". The optional argument [-F path] (don't type the ) sets the path to the database file to be accessed or created. If it is not given, then the environment variable "NK_DATABASE_PATH" names the database file if defined, defaulting to "nk.rwb" in the current directory. The name for each spectrum in the database is taken from its filename sans the ".nk" or "ir.nk" suffix. Starts the nk shell. Type nk commands without the nk; ^Z to exit. must be in the leaf directory only. Delete spectra of names matching GLOB from database. List names of spectra matching GLOB in database. List names and data ranges of spectra matching GLOB in database. List names and descriptions of spectra matching GLOB in database. Add chemical-symbol and description annotations to database. NUMBER can be fixed or floating point; the UNIT either "eV"
Prints this help and exits. Although it tries to be careful, if the nk script encounters an unexpected condition while the database file (default nk.rwb) has a table open for writing, then the database file can become unusable from both the nk script and design files. This damage will only result from the nk script; all simulations should be read-only from database files. If the wedged database was nk.rwb from the distribution, then retrieve nk.rwb from the distribution. Otherwise rebuild your database (using nk --add commands). This way, mishaps while importing spectra will not wedge FreeSnell's nk.rwb. Multiple databases can be accessed simultaneously by design files. As for the distributed nk.rwb, most of the tabular source data is not distributed with FreeSnell. It is stored in subdirectories of the FreeSnell development directory. Some of the files are modified because of technical flaws. In order to get the smoothest combined spectra, files must be added in a certain order, which is accomplished by the Makefile. Correct the two downward spikes in "fesi2el2.nk". Remove the short wavelength sections from "AlAs_palik.nk", "AlAb_palik.nk", "ThF4_palik.nk", and "CsI_palik.nk". The end of "CsI_palik.nk" still looks damaged. Remove 3 spikes from "KCl_palik.nk". Add a header (like in "V_palik.nk") to "Be_palik.nk". >>>> co: 1.3.eV not in range 1.38 to 4.96. The next section tests FreeSnell's modeling of dielectric films.